Success is what everybody wants and what everyone is trying to achieve. 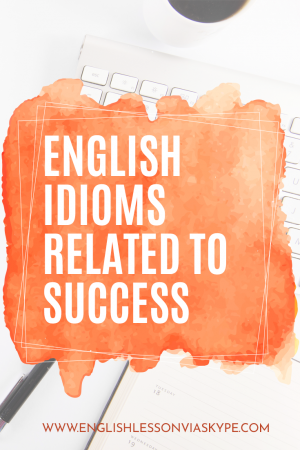 Here are some useful English expressions about success. I also include a note for you as to how to use English expressions connected for achieving success correctly. Let’s start. When we want to succeed we are always advised to prepare. If you are well prepared you have a better opportunity of succeeding. Some of that preparation is also about your appearance. So dress for success is part of the process, part of the preparation to achieve your goals and create a good first impression. For example, it is in a certain way, you have better chances to succeed in your job interview. This English phrase can refer to any part of lives. It can apply equally to business and sport. Most people who play sport seriously never like losing and will always tell you they are in it to win it. It is like a mantra (their mission statement). So any time we are attempting to succeed in a business venture or in a sporting activity we really want to win and one (not the only reason) reason to get involved is to try and win. Participating is important but winning is a good measure of our success. This may well be a common phrase used by candidates in a political election. For anything to be successful there is a need for an important trigger, a critical ingredient that will help you to achieve your goals. For example, if you are launching a new product you need to have done plenty of research to ensure your product is providing something different or something that has never been available before. Finding that special ingredient will be your key to success. ex. The team were very good and were always near the top of the league. The key to their success when they actually won the league was the signing of a great striker who scored 25 goals in their winning season. When you do actually achieve your goals and when you do win that contract or launch that great product you will really want to maximise the gains and demonstrate that your business is or will be a howling success. A howling success is something a little bit unexpected, something that soars and takes off with record sales. The launch of the Apple™ mobile phones is always a howling success with queues outside stores waiting days to get their hands on the latest model. When we spend hours, days and weeks planning and plotting our way through a detailed marketing campaign to achieve success we finally reach a point when we can say we have succeeded. In this situation we can use the expression it’s in the bag, it’s a done deal. We’re certain that this is going to happen. ex. – What about that new contract we pitched for? Any news? -Yes, we got the green light (successful call) today, it’s in the bag! 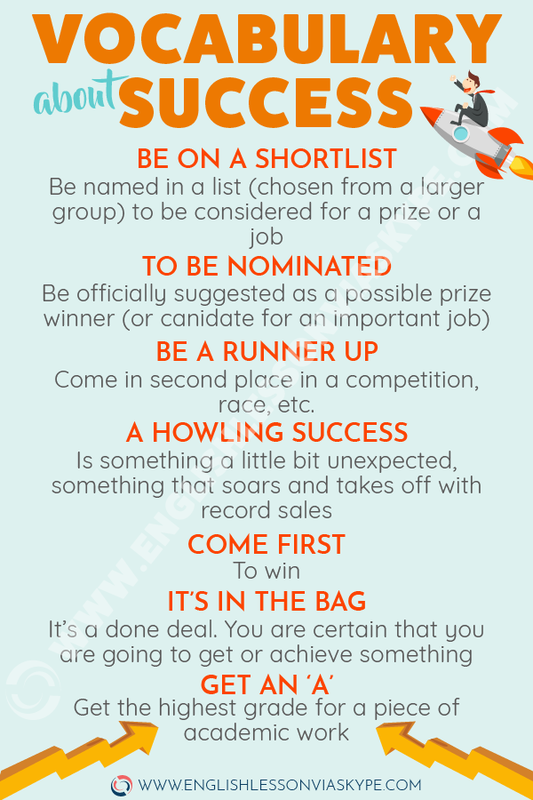 Be named in a list (chosen from a larger group) to be considered for a prize or a job. ex. I got an email a few days ago stating that I was on a shortlist for further consideration for a position that I really want. Be officially suggested as a possible prize winner (or canidate for an important job). ex. Saoirse Ronan has been nominated in the Best Actress category for the 2018 Academy Awards. Come in second place in a competition, race, etc. ex. She was a runner up for four years, but kept reaching for the top. Be part of a group that wins a game, competition, race, etc. ex. Congratulations to Amy Smith who was on the winning team at the School Grande Regional Competion on 23rd May! Get the highest grade for an exam, piece of academic work, etc. ex. For my GCSE, I got an A in Science.